Pleasure for the Empire: British or American? So: Star Wars -- is it a British or an American film? Most people would say it's American. It was shot mostly in Britain (and a bit in Tunisia and some in California). But the director, George Lucas, is a US citizen. So Star Wars = American film. Alien then was clearly a British film. It was shot in Britain, with a British director (Ridley again). But with Fox's money so it's an American film. Aliens must surely be American because it was written and directed by an American and shot in Britain with American money. How do you actually make a British film then? Aren't all movies, seemingly by definition, American? Maybe any movie which gets a major release in the US (not an art-house release) is "American" all others are "art". I can't even begin to ask about "Lord of the Rings" or "District 9". Let's just call them all "American" and get it over with. Even if they're shot in New Zealand and South Africa. With writers and directors from those places. Hmm. I wonder how America became the default location for film production (outside of Bollywood)? Or maybe we should just all give up trying to have different countries. As long as the English don't irk us with their nanny state and we try to not be jerks about the environment. It'll be like the old joke where the English are the policemen, the French are the chefs, and the Swiss run the trains. The Americans will do what? 40 years ago we could have said "The Americans hand out money." How about: "The Americans pretend that their culture is the right one and everyone else pretends that they don't do anything the Americans do even if the Americans got it from us first." Yeah. That makes as much sense as Star Wars being an American film. 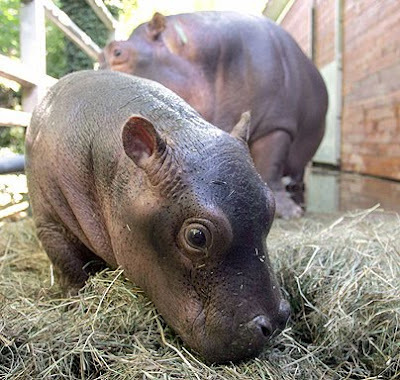 Or this baby hippopatamus. I say we just have one big State and everyone gets to vote for President of the United States. But only citizens of the US are given Telecaster guitars as part of their birth right. I think that instead of asking if you've ever been a member of the Communist Party they should ask if you're a "Friend of Leo." Note, of course, that I'm actually a Les Paul partisan. That makes me something like an anarchist. If the protagonist speaks with an American accent, it is an American film. But The Third Man is a British film, so... aw, hell. Also, I am a big fan of a "One Telecaster per child" policy. Perhaps we can start up a guitar lobby. "You can have my Tele' when you pry it from my cold, dead hands." The British might be more prone to use Rickenbackers. That might be the big difference. I'm thinking "No Telecaster Left Behind". The Congressional investigation into whether some Mexican or Japanese Tele's are actually better quality than American Tele's will get quite heated. I wonder what Lindy Fralin would say. oh sure, a telecaster can sound good in the right hands. my objection to them is the feel of the plank like things and the generally potato like body design. strats were voluptuous and sculpted, put some legs on a tele and you've got an end table. as for the japanese fenders, my understanding is that when they decided to manufacture there, they just pulled leo's original dies out of storage and shipped them over, rather than cutting new ones. these days i'm all ibanez. i don't even own a solid body. but my leo friendliness is sitting in my '82 rivera designed concert, single 12 combo. but then i am canadian which makes me a socialist by dint of medical coverage or something. Soon every able-bodied person over the age of 16 will will have a government-issued Mexican Telecaster with two (2) spare string sets locked in his/her bedroom closet. As for Canada -- have you ever noticed the incredibly high percentage of Canadians in music and Film in the English-speaking world? Especially when you consider how relatively small the Canadian population is in the English-speaking world? Clearly Canada is the country in control that likes to pretend that it's not. well here in canada, during the long, long winters, the segment of the population that can't get dates and bide the cold season by frisking... well, the mind turns to more creative pursuits. like taking over the world one cineplex at a time! bwahahaha! thus, if film is a director's medium then avatar... canadian film. we win. again. Oh crap -- you're right -- Avatar is Canadian! When I cited Aliens I was totally not thinking -- Jim Cameron throws the curve. Well at least Hitchcock was American.